Industrial slip resistant floor coating, sometimes referred to as non skid coatings or 09 61 13 can be used as a standalone application or combined with other floor coatings such as chemical resistance and abrasion resistance. Industrial slip resistance on floors ensures the safety and security of employees, workers and guests especially when water, oil or other liquids, dusts, powders, fine abrasives, or other particles come in contact with, or spill on, the concrete floor. The durable enhanced traction, often mistakenly called non-slip, surface is installed with Concare’s experienced floor coating installation team, ready to stand up the movement of heavy loads, cracking, splitting or peeling. Installing an industrial slip resistant floor coating requires minimal downtime which is critical to business operations. 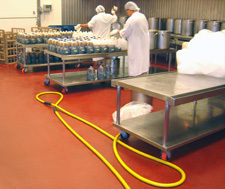 Contact us for an industrial slip resistant floor coating today.